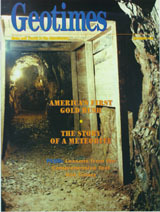 This photo, taken in May 1980, is a view of the Linker Adit, an entry into the restored Reed Gold Mine, a state historic site in North Carolina and site of the beginning of America’s first gold rush. The adit is now the main entrance into 400 feet of restored underground tunnels the public can tour. Gold was first found on the Reed property in 1799 in Meadow Creek. Underground mining didn’t begin until after 1825, when Matthias Barringer discovered that gold could be found underground in quartz. The tunnels in the Reed mine follow quartz veins. Photo supplied courtesy of the North Carolina Division of Cultural Resources. What happens when a meteorite falls to Earth? Where does it end up? What information does it contain about its parent asteroid or the solar system? The associate curator of the national meteorite collection answers these questions through the story of one unique meteorite that fell in Burnwell, Ken., and has become a valuable research specimen. Long before the 1848 start of the gold rush in California, young Conrad Reed discovered a 17-pound gold nugget in Meadow Creek in central North Carolina in 1799. Unknown to most, it was this modest event that marked the beginning of the country’s first gold rush. Thus 1999 marks the 200th anniversary of this discovery, as well as the 175th anniversary of the North Carolina Geological Survey. Dennis LaPoint, a Carolina economic geologist, offers a description of gold exploration and geological discovery in North Carolina, and a sobering perspective on the future of mining in the southeast.